You are here: Home / Jewelry / Rings / Tourmaline filigree ring, 1930’s. I’m a little biased about this tourmaline filigree ring because I happen to own one of a similar design, but with an onyx. When I wear that ring I usually end up spending half the day staring at it, because it’s so beautiful. I wear it frequently. And yes, I often trip over things. 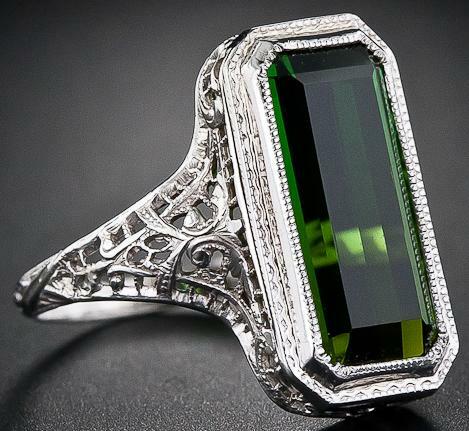 This antique tourmaline filigree ring is set with a gorgeous, richly green tourmaline. The ring itself is made of white gold, formed into stunningly intricate filigree. I’m completely charmed by it – the color, the filigree, the low profile. It’s bold and understated at the same time. I think you could wear this with jeans and a blouse to get drinks after work or for formal occasions. If you also would like to trip over things as you stare at your jewelry, this tourmaline filigree ring is currently for sale at Lang Antiques. All photos and info are thanks to Lang. You have great taste! I love this ring too. This piece was listed for sale by Lang Antiques. You’ll want to contact them for availability and purchase information – if I can help, please let me know and I’ll be happy to connect you directly with them over email! Precious pasta jewelry from Alison Lou.